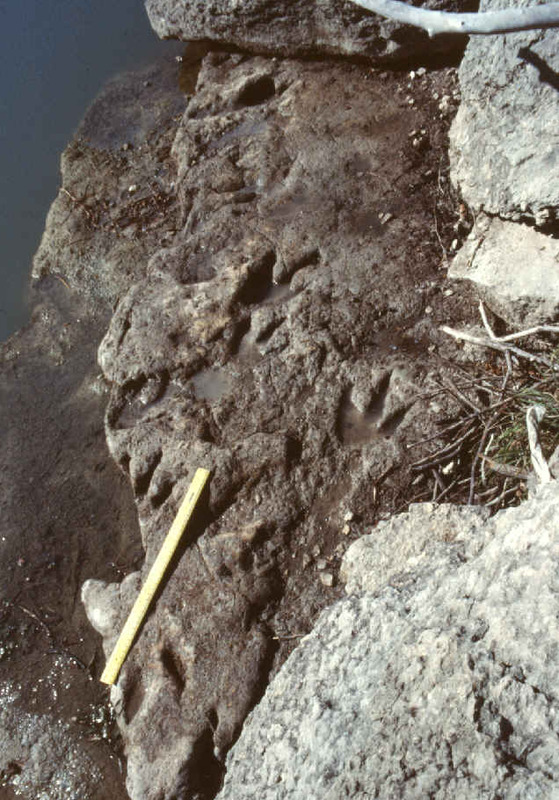 A distinct Acrocanthosaurus track in the Paluxy Riverbed, Dinosaur Valley State Park, Glen Rose, Texas, made by a bipedal, meating eating dinosaur. One can also check the Paluxy water level through an on-line water gauge. Glen Rose is located along Rt. 67 about 70 miles southwest of the Dallas/Fort Worth airport. DVSP is about 3 miles west of downtown Glen Rose, along highway 205. Just before a major curve to the left along 205, turn right onto Park Road 59, which leads directly into the park entrance and visitor's center about 1/2 mile ahead. There you will need to stop and pay a modest entrance fee. At the visitors center are several interesting interpretive displays, including trackway replicas, foot skeletons, photographs, murals, and trackway diagrams. Ourside is a cement replica of a series of theropod and sauropod dinosaur tracks. For more information on park fees and facilities, visit the Texas Parks and Wildlife website on Dinosaur Valley State Park at www.tpwd.state.tx.us/park/dinosaur/dinosaur.htm For more photos of the dinosaur tracks in the park and elsewhere, please visit my dinosaur track photo gallery. The fossilized tracks in the Paluxy belong to two main types: many are three-toed, sharp-clawed prints made by two-legged meat-eating dinosaurs called theropods. Most of these prints (which are typically 15 to 25 inches long) are thought to have been made by Acrocanthosaurus, which could grow to 40 feet in length (almost as large as a T. rex) and whose bones have been found in nearby rocks of similar age. It also somewhat resembled , but had a ridge along it's back, and three instead of two toes on it's forelimbs. Other tracks in the Paluxy are even larger footprints (some over a yard long) made by huge, four-legged, long-necked plant-eating dinosaurs known as sauropods, sometimes informally called brontosaurs. The rear prints somewhat resemble giant bear tracks. The first three toes had large claws angled toward the outside of the foot; the last two were smaller and blunter. The front prints are more round and elephant-like, with blunt, peg-like toes spread around the foot. They were made by dinosaurs 40 to 60 feet long, and weighing perhaps 20 tons. 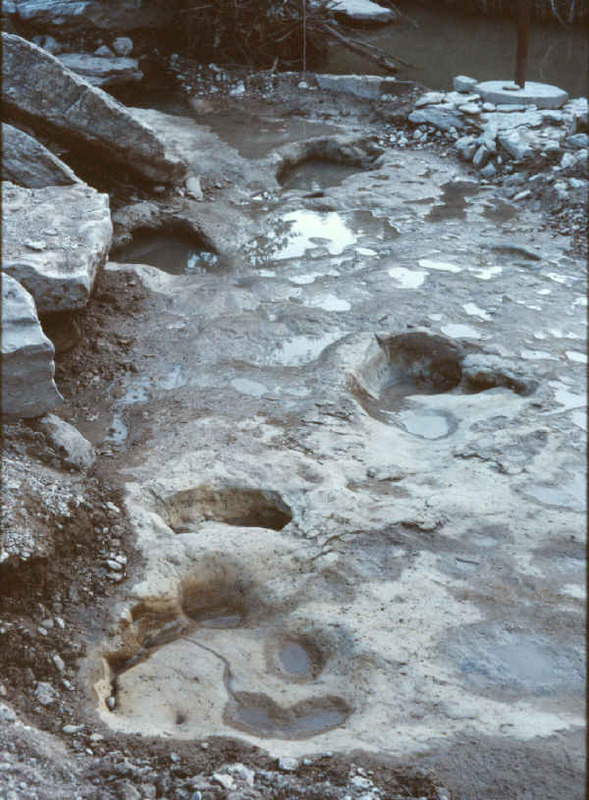 Trail of sauropod tracks, Main Site, Dinosaur Valley State Park. Sauropod tracks were first found by some local residents such as Charlie Moss in the early 1039's, who reportedly mistook them for ancient mammoth or mastodon tracks. In 1938 they were officially identified by paleontologist Roland T. Bird of the American Museum of Natural History in New York, who formed a local work team under the WPA program to chisel out a long series of the best tracks, most of which were later mounted behind a sauropod skeleton at the American Museum. 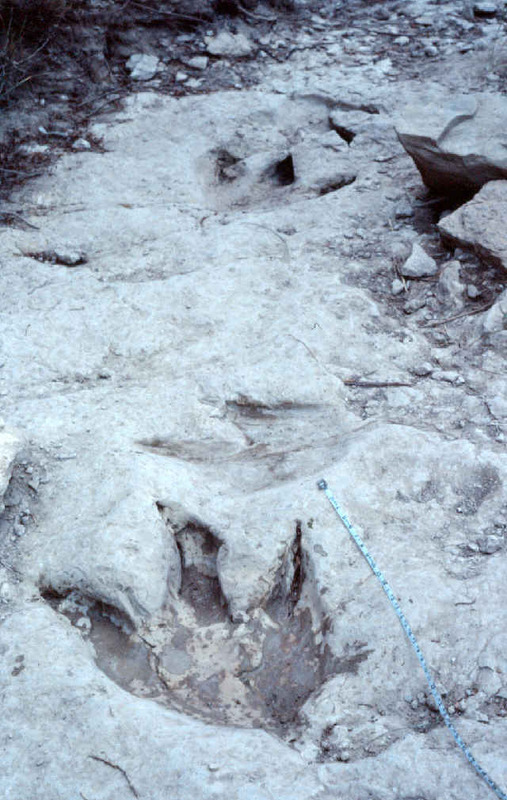 Paleontologists once associated the sauropod tracks in Glen Rose with the titanosaurid dinosaur Pleurocoelus, since skeletal remains of that dinosaur have been found in nearby strata of the same age. However, in 2007 these bones were reevaluated and assigned to a new sauropod genus: Paluxysaurus (Rose, 2007), which has since been declared the official state dinosaur by the Texas legislature. Still more recently the Paluxy sauropod trackmaker has been associated with the dinosaur Sauroposeidon for technical reasons, but it refers to the same dinosaur as Paluxysaurus. 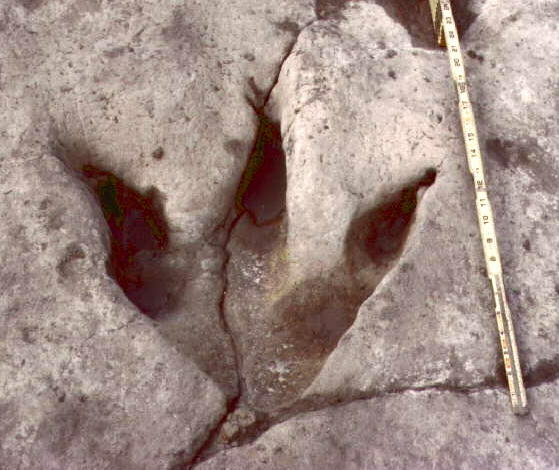 Less common types of tracks seen in the riverbed include unusually elongated prints called "metatarsal tracks" because the dinosaurs that made them sometimes impressed their metatarsi (soles and heels) as they walked. Many if not most of these tracks may have been made by an ornithmimid or "ostrich mimic" dinosaur, although the exact species is uncertain. Some of these elongate tracks have been mistaken for human footprints when their digits are reduced by mud-collapse or infilling, especially when poorly cleaned. Even rarer tracks in the Paluxy are those of two-legged, plant-eating dinosaurs known as ornithopods. Their tracks are wider than they are long, and show three wide, blunt toes. They may have been made by an Iquanodont or similar dinosaur. The Lower Cretaceous track beds in DVSP are dated by geologists as approximately 112 millions years old. The original environment in which the tracks were made was originally a vast tidal flat or lagoon along the margin of a large shallow sea, essentially the ancient Gulf of Mexico that came farther inland. The theropod dinosaurs which left their tracks there may have come to feed on other dinosaurs or small animals in the mud or shallow water, while most of the sauropods, whose tracks usually occur in parallel trails, indicating that they traveled in herds, and may have been on a migratory trek. Soon after the dinosaurs left their tracks in the moist limy mud, the track surfaces were gently buried with a somewhat different sediment. There they hardened and remained buried through geologic time until re-exposed in modern times by when overlying layers were removed by the action of the Paluxy river (and in some cases, human excavators). Where in the Park Should I Look for Prints? Charts and brochures at the Visitors' Center show several places where dinosaur tracks can be viewed in the park when water levels are low. Two of the best places are the Blue Hole and the Main Site. The Blue hole is a deep sink-hole at a bend in the Paluxy, where one can swim, fish, and view many theropod tracks (which cover the surrounding limestone shelves) all in one place. One can get to the Blue Hole from a path near the western camping area, or by walking upstream (toward the visitor center) from the Main Site. The Main Site is located across the northwest parking lot in the park. To get to the tracks, you must descend a stone staircase to the river, and then cross a series of stepping stones to the other side. The tracks in this area, which the park staff tries to keep clean, include both sauropod and theropod tracks, as well as a rare tail impression. Just south of this area are additional sauropod tracks, including the remains of the famous trackways removed by paleontologist Roland Bird decades ago; although these are in a lower part of the river that is usually under water even in summer. For more information on these sites and more track photos, please visit the "field trip planner" from a Houston Gem and Mineral Society field trip. The planner includes stop-by-stop descritions of several tracksites and other attractions in the state park. Theropod dinosaur tracks on ledge at Blue Hole site. Most of the Paluxy sites once claimed to contain human prints are outside DVSP, and have been shown to consist of a variety of misidentified phenomena. The most common are forms of metatarsal (heel-impressed) dinosaur tracks whose digits are subdued by mud-collapse or infilling. However, one of the "man track" sites called the "State Park Shelf" is next to the Main Site described above, on a shelf about a meter above the main track layer. Here the alleged human tracks are not real prints of any kind, but rather erosional markings that were sometimes selectively highlighted to encourage human shapes. Without such selective highlighting their human resemblance is largely lost. Indeed, the entire shelf is covered with countless depressions of all shapes and sizes, but no distinct or convincing prints of any kind. In contrast, the nearby Main Site (on the bed bed about 3 feet lower) contains many well-preserved dinosaur tracks. For the best chance of seeing the most dinosaur tracks, late summer is ideal, when the river typically is running very low, and the greatest number of tracks are exposed. However, it is also the hottest time of year, and often the most crowed. Mid May is a pleasant time to visit, when temperatures are cooler, at least some tracks are usually dry. Around that time the park is also less crowded, and vast fields of bluebonnets are in bloom. Fall is another pleasant time to visit, especially late September or early October, when the river often is still running low, but temperatures are bearable. Often rains have started by late October, but the last weekend of October features a great fossil show called Fossilmania at the exposition center on Rt. 67, which is sponsored by the Dallas Paleontology Society and the Austin Paleontology Society. Along with your natural curiosity, some recommended things to bring include a camera, a hat and sun-screen to avoid sun-burn, insect repellent, and perhaps some old sneakers or other footwear you don't mind getting wet, if you wish to explore the riverbed for tracks (even in summer, many tracks are under shallow water). At the "Main Site" some of the best dinosaur tracks are usually kept clean by park personnel, and are enclosed in roped-off areas (which should not be crossed). Tracks in other parts of the park may be approached more closely, and if you wish to bring a wisk brush or broom, you can gently clean them for better viewing. Please be careful where you step: many tracks have cracks running through them, and are suseptible to cracking from people stepping on them. If you will be spending some time hiking around, long pants are recommended (prickly bull nettles and poison ivy are abundant, and snakes are not uncommon). Naturally, if you plan to camp, swim, or fish, bring along the appropriate gear. Glen Rose has about a dozen motels within 15 minutes of the state park. Camping facilities in Dinosaur Valley State Park include tent and RV plots with water and electrical hookups, and nearby showers. Camping and cabins are also available at Oakdale Park (phone 817-897-2321) located just south of town. Although growing quickly in recent years, Glen Rose is still a small town with laid-back, southern charm. In Glen Rose one will find several restaurants (including good Tex-Mex, Bar-B-Q, and southern cooking), the Somervell County Museum (displaying local artifacts and antiques), and several quaint shops. A few miles west of town along Hwy 67 is Fossil Rim Wildlife Ranch (254-897-2960), a large, drive-through African wildlife ranch with herds of giraffes, ostriches, gazelles, and dozens of other exotic animals. Several other parks and attractions are located within easy driving distance of Glen Rose. Contact the Glen Rose chamber of commerce at the address listed earlier for more information. For more information on Dinosaur Valley State Park, a color booklet by James Farlow entitled The Dinosaurs of Dinosaur Valley State Park (1993) is available from Texas Parks and Wildlife Department at 4200 Smith School Road, Austin, TX, 78744. Dinosaur Valley State Park - Official site of the Texas Department of Parks and Wildlife. Describes the history of the park, activities, and accomodations. Overview of Dinosaur Tracking - Covers the formation, study, and documentation of dinosaur tracks. Includes a list of other places to visit dinosaur tracks. The Paluxy Dinosaur/Man Track Controversy By Glen Kuban. A collection of articles discussing various aspects of the Glen Rose tracks and human footprint controvesy.